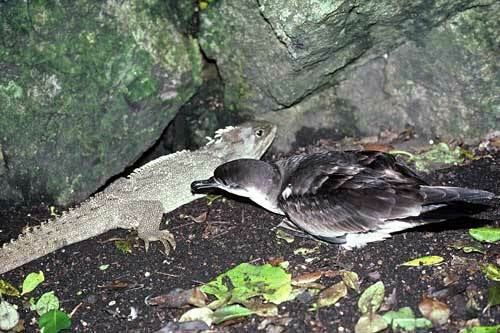 Tuatara often share burrows with seabirds, such as this Buller’s shearwater on the Poor Knights Islands. Tuatara are carnivorous, and sometimes eat seabird chicks. Active at night, tuatara mostly feed on wētā and other insects, lizards and worms. They spend much of the day in their burrows, but will come out to sunbathe – sunlight is essential for growth, and provides extra energy for females when producing eggs.